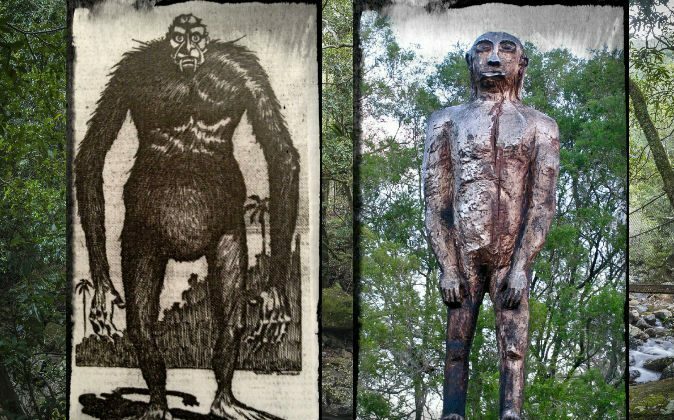 Australia’s Bigfoot (Yowie) Explained by Weird Physics? Bigfoot is often conceptualized as an elusive primate unknown to modern science—but there are other ways of looking at it. As fantastic as the idea of an unidentified primate is, it gets weirder as we explore other theories. Lore related to such a creature is ubiquitous—from the yeti of the Himalayas, to the sasquatch of North America, to the legendary creature in Australia known by several names, including dulugal, hairy man, yahoo, yowie, or the Australian gorilla. We will focus primarily on Australia’s yowie, discussing theories about its unusual form. Modern physics has opened up many questions concerning the forms matter can take, other dimensions, and the role of human consciousness in affecting physical reality. Some theories about yowie may overlap with these questions, while some others focus more on how humans perceive the unfamiliar things around them. We will start, however, with an exemplary tale to set the scene. Charles Harper worked as a surveyor in the coastal mountains and gorges of New South Wales, Australia, for about 50 years. His yowie account was published by the Sydney Sun on Nov. 10, 1912. It is included in the book “The Yowie: In Search of Australia’s Bigfoot,” by Tony Healy and Paul Cropper. 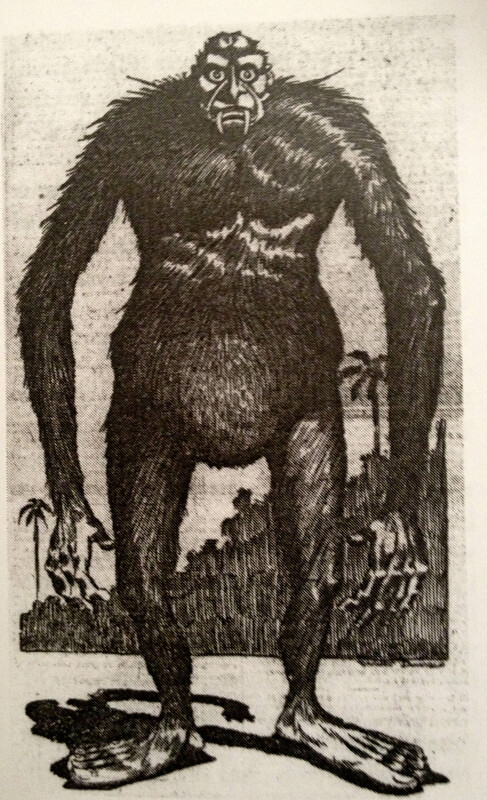 The creature described by Charles Harper, depicted by Will Donald for the Sydney Sun in 1912. Harper described the yowie’s long arms and its thigh, which was out of proportion with the rest of the leg. He said: “The head and face were very small, but very human. The eyes were large, dark, and piercing, deeply set. A most horrible mouth was ornamented with two large and long canine teeth. When the jaws were closed, they protruded over the lower lip.” The creature ran off on all fours. Harper and his men abandoned their work and left, too. In the Blue Mountains region at Springwood, west of Sydney, residents have reported multiple sightings. Jerry and Sue O’Connor, for example, experienced repeated encounters with yowie on their property, they told Healy and Cropper. They have reported seeing large, hairy ape-men close to their house who have left tracks and thumped the walls. The O’Connors also reported a sort of electrical phenomenon that accompanies the encounters. A place on the O’Connor’s property the yowies are seemingly drawn to contains an electricity meter and fuse box. In America, bigfoot researcher Stan Gordon has also noted that bigfoot is reportedly drawn to electricity meters. The Australian Aborigines have said the yowie is most likely to appear during a storm, when the electric charge of lightning may be present. If the yowie has some kind of electric charge to it, it seems to stand out even more from simple primates. Modern physicists recognize the possible existence of several other dimensions, and how those dimensions may interact with our own is still far from understood. Some say the yowie may exist in another dimension or realm. As strange as it may sound, Sue O’Connor has said she’s connected telepathically with a yowie and thus come to understand that these creatures exist in another dimension. Healy and Cropper were convinced that the O’Connors were very sincere in their accounts, having interacted with them over the course of five years during their research. They said the O’Connors swore on their daughter’s grave what they reported is true and that they have both expressed a readiness to take lie-detector tests. They could be “paranormal or paraphysical apparitions,” Keel said. Canadian native peoples speak of the windigo (the spelling varies), a monstrous and solitary creature connected with insanity. In areas with a high number of yowie sightings, perhaps mass hysteria could be part of the explanation. Mass hysteria refers in part to collective delusions, especially those incited by fear of threat. In areas with a high number of yowie sightings, perhaps mass hysteria could be part of the explanation. Humankind has always reported sightings of unusual creatures. On medieval maps, one often sees depictions of dog-headed men, cyclops, sea monsters, and more, alongside normal and practical information about ports and coastlines. Some of the mythological creatures are said to be depictions of foreign people or foreign animals. The early explorers may have found these foreigners so incomprehensible that their descriptions of them could be interpreted in bizarre ways. Could something of this confusion be related to the yowie legends? Graham Joyner, a researcher of what he refers to as the “Australian gorilla,” discussed with Australia’s national broadcaster ABC how early settlers may have been at a loss to describe an unknown creature. He cited the ideas of German philosopher Immanuel Kant, as developed further by philosopher Umberto Eco. “The unknown is often seen in terms of the known,” Joyner summarized. For example, when Marco Polo first saw a rhinoceros, it was a creature completely unfamiliar to him. He did know of the mythical unicorn, however, and surmised that the rhinoceros must be a grotesque unicorn. Similarly, the Aztecs had perceived the conquistadors’ horses as large deer. In Joyner’s view, the Australian gorilla is a real creature, though elusive, and the yowie is a mythical creature. He thinks researchers today tend to fit inexplicable evidence into the familiar paradigm. They explain away the evidence of the Australian gorilla, a creature unfamiliar to them, by relating it to creatures or phenomena they are familiar with—even when, in Joyner’s opinion, it’s an implausible stretch.